ATI Technologies today announced that Microsoft Corp. has chosen ATI’s H.264 decoder for the Xbox 360 HD DVD player, bringing users sharper and more true-to-life visuals and smoother playback of high-definition content. HD DVDs encoded using one of three approved codecs deliver up to six times the resolution of traditional DVDs all ON a single disc. Built ON ATI’s Avivo technology, the decoder used for the Xbox 360 HD DVD player brings to bear ATI’s considerable multimedia know-how to ensure gamers, home theatre buffs and casual viewers alike get a more perfect picture from the H.264 format. 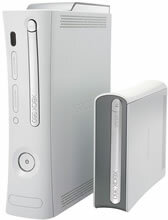 To enable the smoothest H.264 video playback possible and the ATI decoder technology makes use of the Xbox 360 ‘ s graphics processing unit (GPU) to accelerate video processing. The unified shader design of the GPU enables high-end processing techniques such as comb filtering and automatic gain control to ensure that video artifacts such as blockiness or color bands don’t disrupt playback. ATI’s H.264 decoder brings sharper and more true-to-life high-definition content to homes everywhere.